Choose a name for your music track that describes the feel, mood, style, genre, of the track. 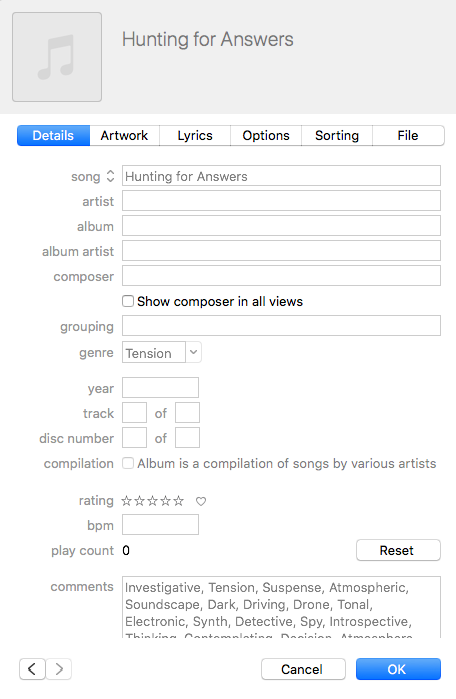 Reference downloadable tracks to match track to title. You want to make it easy for the music supervisor to see what the music will sound like by the title of the piece. Send in variations/alt mixes/ stems of your cue (Full, Minimal, No Drums, Drone, etc.) This will help you get more placements and gives a music supervisors of a TV show more layers of your track to play with when syncing a track up to a show. Submit tracks that are 90-120 seconds in length. They are known to have higher placement rates. It doesn’t have to be exactly 90-120 seconds but has to be very close to those lengths. 1. Please create short endings also known as button or stinger endings with your submissions. Our publishers are requesting tracks with button endings or endings with build up stinger sound effect also with short endings. 2. No long or un-natural fade outs. Make sure you leave 1-3 seconds of silence at the end. A good ending is going to be the ultimate decider on whether a cue is placed. 1. Please bounce or export out music cues in high quality .mp3 320kbps files. Any other formats submitted will be rejected. Check out the “Pro Audio Converter” app for a fast way to convert your audio files. Click Get Info – to add meta data. Please put brief descriptions/keywords in the “comments” space in iTunes. Put commas between each descriptions or keyword. Add 10-20 keywords minimum. The better you keyword your submissions the easier it will be for a supervisor to find your material in the catalog(s). If you are not currently using iTunes for conversion or meta tagging, start now! It’s very simple. Select and Add Category/Genre in the Category field drop down menu. Only one genre please. Please do not tag the composer, album, artist, label, and do NOT use track numbers either. 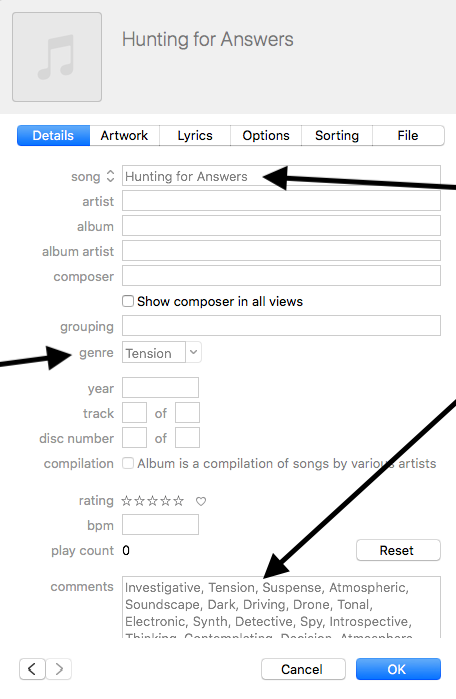 Only add what we ask, which is track title, genre, description/keywords in comments field. thanks! Having trouble adding meta data? Learn more about why meta data is important here. By now you have all your tracks formatted correctly. Now its time to put your music files in a folder to send in. Only submit one submission at a time until cleared by James and Collin. If you have multiple genres in one folder please write them into the folder title. Thanks. If you do not do this properly, we will send an email back asking you to fix it. It’s important to be consistent and professional in all our submissions and labelling. Submission Protocol: NOTE: for your first few submissions, please only send in 2 cues. Once we see you are getting our prep and delivery protocol down, we will release the 2 cue submission limit to 20 files per submission. Please allow 1 submission to process at a time. Never send multiple submission. Wait until James and Collin give you the green light to send more. Once you submit, please allow 2-4 business days for us to get back to you. When sending a folder DO NOT use the “invite” option on Box.com. Simply click “share” copy the link that’s provided, paste it into the submission form. Remember, it is up to you to re-title your tracks before submitting them to us. The titles must be free to register for use on shows. They can not already be registered to your own personal PRO number under the same title(s). If they are already registered, change the titles. Make sure you hit reply all to any emails.